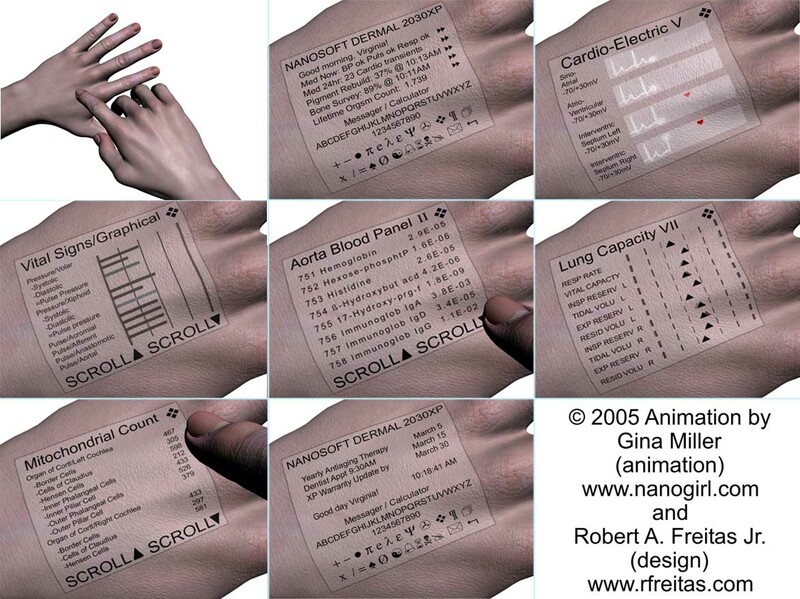 In his book Nanomedicine, Volume I: Basic Capabilities [available on the web at http://www.nanomedicine.com/NMI.htm ], Robert A. Freitas Jr. describes [in section 7.4.6.7 (page 204)] a "programmable dermal display" in which a population of about 3 billion display pixel robots would be permanently implanted a fraction of a mm under the surface of the skin, covering a rectangle 6 cm x 5 cm on the back of the hand. Photons emitted by these pixel bots would produce an image on the surface of the skin. This pixelbot array could be programmed to form any of many thousands of displays. Each display would be capable of two functions: (1) presenting to the user data received from the large population of medical bots that roam the user's body; (2) conveying instructions from the user to that same large population of bots. The display could be activated or deactivated by finger tapping on the skin. This 3-minute animation illustrates the motions and live interaction of these display screens. I began this project in March and it has been both the most challenging and the most educational of the animations that I have done so far. Since the functions illustrated on the display represent actual data that could be obtained in real time from a human body equipped with the dermal display screen each moment of this animation had specific guidelines for timing and movement directed to me from the author. I am very grateful to have had this experience in which I have learned so much and I hope that this animation helps to visualize what Robert A. Freitas Jr. theorizes in his wonderful books on the subject. To see the movie click here (.mov 8.61Mb opens using Quicktime). Alternately you click here to view the movie (.wmv 10.14Mb opens using Windows Media Player). Watch Dermal Display animation narrated by the author Robert A. Freitas Jr. while giving a presentation at the 6th Alcor conference (added 9/1/07). Downloads require some patience, depending on what type of connection you have. These movies have been compressed from their original quality for online downloading; due to this you may see lower resolution artifacts. Note to the media (and website readers who wish to use images): Permission is required for print or other use of this image, click here to send an email request. Click here for a high resolution version of the image below. Below: stills from the movie. James Lewis PhD for your assistance with crunching the numbers. Jude Ng for those late night Combustion emergencies. And of course Robert A. Freitas Jr. for this opportunity. © Copyright Gina Miller and Robert A. Freitas Jr. all rights reserved. Dermal Display topic on my animation blog. Television - History channel August 21rst 2008, Thursday night 10PM 9C - the show is called The Works (Tattoos episode). Aired on Japanese television (Nov 2008), click here to watch the clip. Featured in the The Immortality Institute Film Project. Click here to see the trailer. Also featured in another film on the same topic, a documentary called Immortality produced by Kaléo Films. Aired in France 2008 click here to watch a clip of this documentary! Featured at the 6th and 7th Alcor conference which are both now on DVD. Cryonics magazine has done a feature of me and my work on this animation in thier Winter 2006 edition. Fast Company the next up and coming issue Jan/Feb 2005. PC Magazine - Issue, November 22, 2005, page 22 "Hand me my Data". Popular Science this doesn't cover the animation but does interview Robert A. Freitas Jr. about his concept. 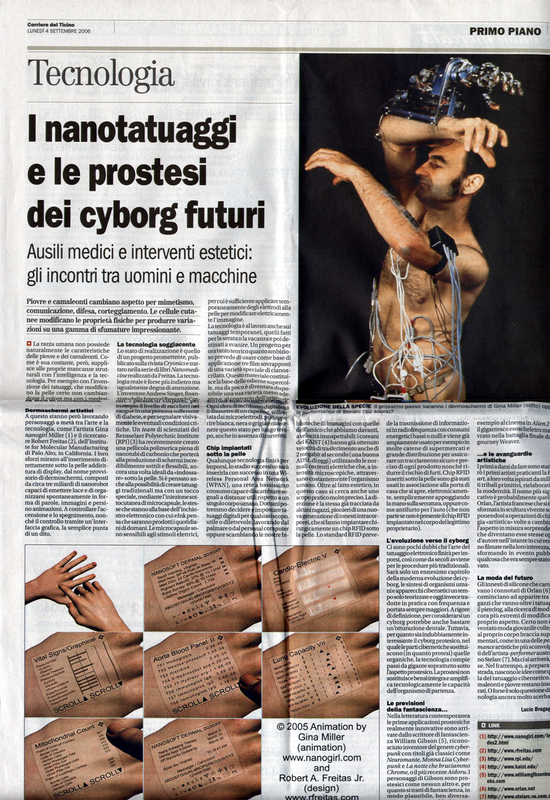 Corriere del Ticino featured a story and the image from this very website on page two (Sept 2006). The "Cité des sciences" museum in Paris, France Nanotechnology exhibit. Standing on the Shoulder of Nanobots article by Ken Sutherland. Mention on KurzweilAI regarding the LifeBoat foundation awards. Nanotech.biz interview with Robert A. Freitas Jr.
Nanotech bis interview part 2 (bottom covers the animation). Discovery Channel scroll down to see the whole article. National Nanotechnology Initiative (news) reports the Discovery article above. Views From the Edge> with comments. 4M 9/30/05 at slot 06:41. Blueyonder Skin Deep article UK. De:Bug Germany - with comments. Tecnocino Italy - with comments. 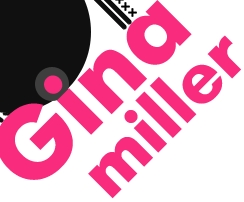 Miss TICs France with comments. Frederic Cavazza France with comments. Life, the universe and everything in it. If you are interested in using this artwork, contact the artist.